Thank you. I know he will enjoy it. I forgot to do this sooner, sorry gang. Greetings from Northern Va USA. 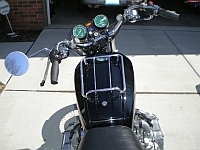 I am finishing up restoring the stock blue 93 GL1500 Aspecade I bought from my next door neighbor. He left it rotting in his backyard for 4 years with a ripped open cover. Commute to work on it weather permitting. See my thread in the GL1500 section on the work so far. Hope to see you in the road, stay safe everyone. I Like the blue, and '93 is a good year! Last year when I went shopping for a new-to-me bike I looked at two other bikes before finding the one I have now. The first one was a Blue 1988, 145k Miles for $4500. Paint a little faded. The owner already had it running when I got there, choke on, 'idling' at 2000 RPM. I spent maybe 10 mins looking it over, turned the choke off and it promptly stalled (AFTER at least 10 mins???). It restarted right away with the choke, the owner said it is cold-blooded and you have to leave the choke on for quite a while before it will run without it. I didn't even test-drive it. Two months later it was still listed for sale. 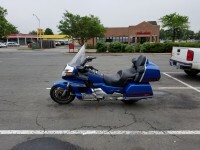 The second bike was an absolutely beautiful 2000 SE (also Blue, two-tone) with 58K miles at a consignment shop for $5300. It had just listed the day before (Craigslist). I would have bought it on the spot, but I was informed it had just sold two hours before. 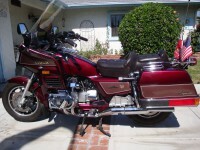 Third bike was the '93 Aspy you see in my Avatar (Photo taken day of purchase). It had 44K Miles, $4800, excellent condition, Turn-key ready. Absolutely fabulous stereo system with CD changer and 7 speaker system with AMP and equalizer. After taking her home I fixed the cruise control (Spray-cleaner in the Cruise-"on" button) and replaced the rear tire with an E4, Timing belts and coolant, added trailer hitch and lights isolator. She pulled my camper cross-country to Michigan and back last year, issue-free. Hello, gang. I did an intro in general chat forum...so, won't duplicate here. Picked up a 1993 Aspencade, nice runner. Have been lurking here for awhile, trying to learn while I was searching for the "right one". No comparison to the Wing I rode in the 70's. On the way home from the sellers house, encountered a long, sweeping banked curve on the highway...what a feeling, just rolling on the throttle through it...it felt like the Wing "settled" into the curve, and wanted more. What a visceral feeling. Hello all. I'm from Seymour, IN. The wife and I bought our first road bike 3 weeks ago. 2002 GL 1800. Sure is a lot of bike but man am I lovin it. I am the 3rd owner. It has 55,000 miles. It has been well kept but needs a little tlc. I used a nickel in the anti-dive device because it seemed so harsh on breaking bumps. It did help out. I've been practicing my low speed stability. I do feel like this suspension leave something to be desired. I guess I had very high expectations from everything I've heard about these machines. This winter I'm going to take it down for many parts swaps and I'm still torn on whether I'm going to do stiffer springs front and rear and bushing seals and oil up front or if I'm just going to go with a full traxxion upgrade. Other than the harsh suspension and the tough time at low speed stability I am absolutely loving this machine. My goal was to get my wife involved and she is actually enjoying it. I bought a bike for crossing the country but yet my wife and I just go to local restaurants. We will work our way up to some long travel hopefully. Sorry I couldn't think of a cool nickname and sorry I keep blabbing on but I do want to say thank you all for the great advice that I've been pouring over these last few weeks. Welcome from the desert southwest. I have close friends in North Vernon. Hello all. My name is Ron Murphy. I just picked up a 1990 GL1500 project bike. I bought it basically stripped of all body work and some misc parts. Motor runs smooth. Plan is build a hot rod to run around with. I can’t ride very long but short rides are better than no rides. I hope that everyone will accept the fact that I’m not restoring or keeping the bike all original as bought new. Thanks for all the info that I’ll get from this page in advance. So... i just picked up a 84 1200 aspencade, for a bartered steal. Guy was asking $450 down from $900 and took a drill press, snapon vice and my 9mm side arm as trade. I was ecstatic. Well i got it home and quickly realized, i must be a wimp because i cant even roll it hahana it took me DAYS to get it on the center stand and check the oil, yea she runs but as it turned out theres almost twice as much oil in the motor as it should be, in addtion to quite a bit of blow by comming out the dip stick when running, im not ready to ride anything yet and plan on takeing the winter to get her and a 2007 vento 1400 i picked up for $100 into shape and finding or makeing trailers to trike them with untill i can buy a full bodied trike kit for the aspencade. Ive made my repairs/parts list and hope to become good friends with other members on this page as, Im a classic chevy guy, and havent ridden since i was a kid on dirt bikes and 4wheelers. Im not in a rush and will happily start work on this all with lots of time in my basement garage and plenty of time to get my endorsements required for rideing. Howdy! I've been a lurker for quite sometime. The "How to" articles are primo! I just replace my GL 1500 cornering bulbs with the new LEDs and I'm super happy with the results. Now I'm considering replacing the headlights with LED versions. Thus I'm entering the "Contest." Hi there, My name is Mike and I have also been following this site for quite a few years. 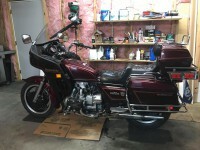 Last winter I totally tore down my 1999 GL1500SE and I couldn't do it without the help form the folks on this site. This summer I completed my bucket list ride, I put over 7000km run to Sturgis SD and it was truly a dream ride. Thanks for all the great info and I will continue hanging around this site for a long time to come! Hi. Yes I am another first time poster. I have been reading Goldwing Docs for quite awhile now and have found some of the info invaluable. 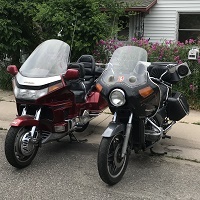 I have two GL1500's and love them. I do as much of the maintenance and repair as possible myself. Keep on doing what you have been doing. Also I have found the product reviews very informative and have purchased a few of them. '94 Wing converted to Champion 3 wheel @ 87K mi in 2011. Just turned over 100K and little time to ride but appreciate this site; it's helped tremendously. Forums & new accessories the best features. Thanks. Back after long absence- good to be back. Location: Port St Lucie Florida, FL. 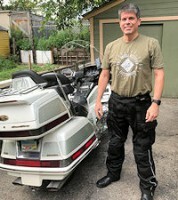 got my first Goldwing this weekend. an 82 gl1100i, 72,000 miles. NO rear brakes, caliper is even missing!:). doing belt change, valve adjustment, gonna throw a vac gauge on the intakes and see how the carbs are doing, although the engine idles pretty nice at about 950 rpm. changing all the control cables, fuel lines and filter. new seals in the forks. engine runs and sounds pretty nice. fuel tank is pretty much spotless. going through the bike and checking/replacing what needs or may need replaced. recently had harleys, a 2000 wide glide, and a 08 road king classic. been riding a can-am spyder rts for the past 3 years, its a nice ride but I REALLY miss being on 2 wheels. i'm stoked! Well the last post I made was telling everyone that I sold my Valkyrie and Gl1200A as I let too many of my family tell me I should stop ridding on 2 wheels at 76, so I bought a 2014 Can Am RT. Well I can tell you that was the worst bike I have ever owned, all I can say is I felt like it would kill me when ridden more then 60 mph and on the freeways, I sold it after 500 mi and never looked back. Welcome back, Bob! We had an ex-Goldwinger at the Gathering this year who had moved to a Spyder for the same reason, with pretty much the same opinion. I guess I have been a member here for almost a year. I am from Denmark, so my posts might be filled with misspellings and awfull gramma. I hope you can forgive me for this. I am 35 year of age (in a month at least) married with 2 kids. 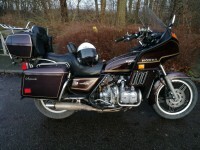 We all enjoy ridding, my wife drives herself, she has a honda CBR600, witch is a great companien for my 1981 GL1100. I have been browsing the site while restoring a little on the old honda. She was quite neglected when i bought her, but she is beginning to come together. She rides fantastic, but is not much of a looker, yet. Reliable is on it's way, but I have to admit, I have never had break down on it, only trouble with the charging system, an the lights. The 1100 is a fine piece of machinery, I think I rescued mine from becoming a source of parts. Then I discovered there was still life in the engine, and she is still running today. You'd be surprised how many international members are on the site. You never know, it is very possible you could meet up with some of our other European members! Not quite countryside, but my cozy corner. We had friday of, so we took the wing out for a spin. Took the wife groceryshopping, and afterwards our eldest son and I drove around for an hour. We remembered to shoot a couple of fotos along the trip. Howdy from Whitecourt.Alberta,its been a while since on here. we stopped riding a few yrs ago and sold the wings. but yesterday was offered a nice restored 84 1200 A for $500 couldn't go wrong. I cant get it on the big stand anymore,so son helped me so we could air up the rear tire and air shocks. previous owner spent $7500 on tires, repainted it.battery.fluids.new seat. he kept dropping it,so parked it. hes been bugging me for few yrs to come get it. I didn't really want a wing again.but?i have a 73 Norton as well that my younger son( 35) took over the restoration of. and this wing my older son(36) would like to start riding.he used all my other wings in the past.so will give to him and I can Borrow off him. tables are turned now.